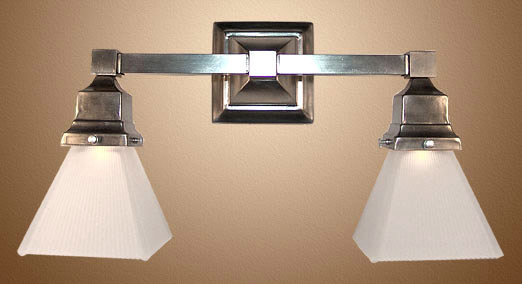 This Mission Style Light works well over your Vanity Mirror in your bath room or powder room. Custom widths are always available to suit your spatial requirements. This one is finished in pewter and can be made in any other metal color. Solid cast brass construction and squared and frosted grooved glass globe. Shown in Antique Pewter. Available in different Metal Finishes, different Glass, Back Plate, multiple arms and many other Custom Options. Width 15 In. or custom / Projection 7 In. / Depth 8 In.